This winter was brutal in most areas of the U.S. Many places hit record low temperatures and had enough snow and ice to keep you stuck at home. While you were keeping warm by the fire and drinking hot chocolate, did you ever stop to think to yourself, "I wonder how my roof is doing?" Probably not! Don’t worry, most people don’t think about that. However, once your roof starts to leak, it’s the only thing you can think about. In order to prevent that from happening, we put together a list of how you can get your roof ready for summer. 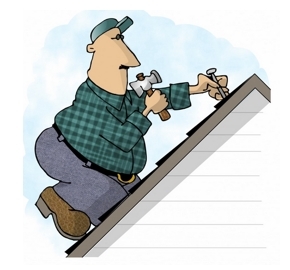 Everything above can be signs of an aging roof, but can be easily fixed and repaired. See below. Having clogged gutters or a drain full of debris will overflow the gutter and could eventually flow into your house. We recommend investing in the AJC Wood Handled Shing-Go Roofing Shovel to help you in this task. Cleaning your HVAC or changing out the filter can prevent condensation from getting into your home. Old antennas, satellites, or vents are areas where water can get in. There is no reason to have them on your roof if they are not being used! Ultraviolet rays can deteriorate your roof. Aluminum coating will cover and lengthen the life span and the rays bounce right off. We hope these tips will help you this summer and help guide you in your winter roofing preparations every year!